I can barely remember the days when I could pack a bottle of shampoo in my carry-on without having to check the ounces listed on the bottle. Let alone when I could pack olive oil, honey and a newly discovered wine or rum in my carry-on. Those days are long gone but the desire to bring wine and other types of liquids home from a holiday are not. The question is, how can you check your luggage and ensure your wines or other bottles survive the process of being checked. I have discovered a few options which are outlined in my Wine Travel Guide. My favorite being the VingardeValise wine suitcase, which is the purpose of this review. The VingardeValise has been on the market since 2014. I was lucky to have received one to review when it first launched. The wine suitcase has evolved in the last few years but its goal in helping wines survive the process of being packed in checked luggage hasn’t. It was initially launched for wine lovers who wanted to bring an entire case of wine home with them (12 bottles, 750 ml bottles) without the worry of breakage and/or cost of having wine shipped. What’s unique about the VingardeValise wine suitcase is that it was designed to be a suitcase AND a wine carrier. Its construction and removable foam inserts make it perfect for traveling with other fragile items or simply making it your personal luggage. The VingardeValise wine suitcase is built with an impact resistant polycarbonate shell that protects the bottles sealed inside the case. It features removable foam modules that hold a variety of different sized wine bottles. Since the foam can be removed you can also use the VinGardeValise as a suitcase. There are two options for the VinGardeValise – 12-BottleGrand and a smaller, carry-on sized 8-Bottle Petite. With the separated, sealed sides of the wine suitcase, you can easily pack six or four bottles on one side, seal it and then pack your clothing on the other. 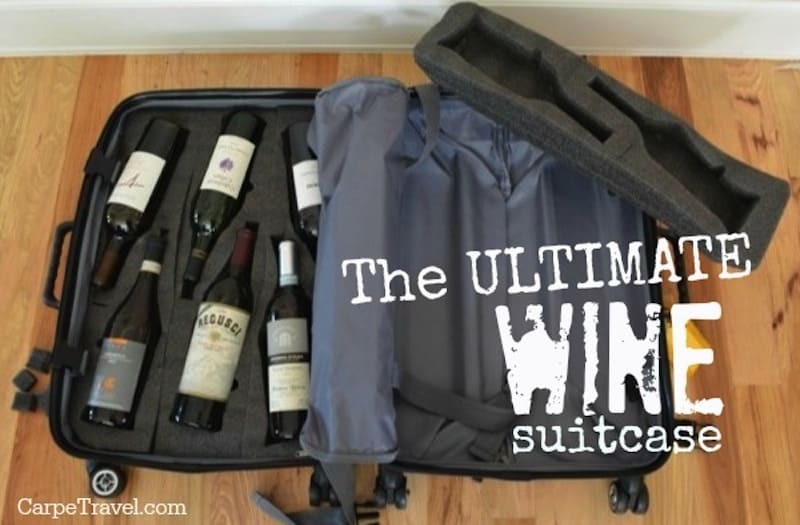 Or just pack the entire wine suitcase with wine and forgo the clothes. If you’re worried about the changes in temperature, which can wreak havoc on your wine – don’t be. The VinGardeValise is temperature resistant too. One of the best things is that the VinGardeValise offers the HomingPIN® global lost luggage tracker with a one year complimentary service subscription. If you’re prone to loosing your luggage, you won’t. The wine suitcase also features a TSA compliant lock that is mounted and integrated into the bag for another level of security. 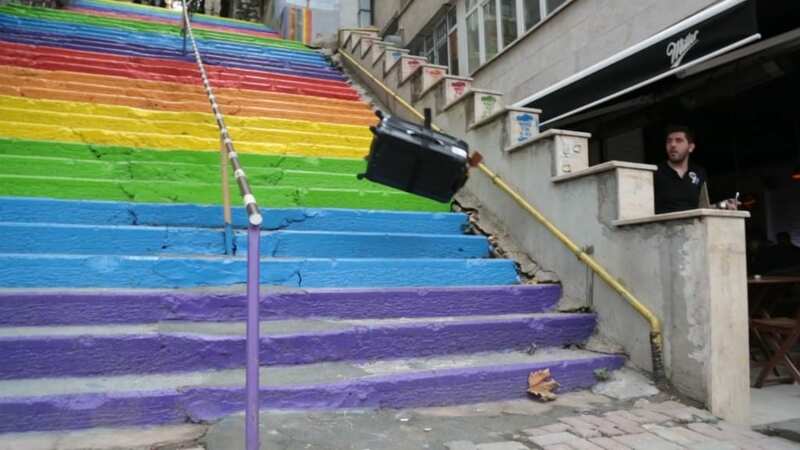 Throwing a suitcase – filled with wine – down a rainbow of stairs in the art district of Istanbul and again at the Star Ferry Pier in Hong Kong isn’t something most people would do, at least not on purpose. I spent three years doing just that. Traveling around the world, testing and retesting the VingardeValise wine suitcase to see if it could actually protect 12 bottles of wine from desert heat, bitter cold, rough luggage handlers, falling down stairs and even swimming in the ocean. Never once did a bottle break…but I did loose a wheel once.” – Barry Wax, the creator of the VingardeValise wine suitcase. I have traveled extensively with the VinGardeValise. Using it both as a wine suitcase and as a standalone carry-on. I think that’s the thing I love the most about it – it’s dual purpose. If I’m not traveling with wine and know I won’t be bringing anything home this is the bag I take. All I have to do is remove the foam inserts. However if I’m traveling to wine country I can use this bag as a carry-on on my way there since it allows for me to pack clothing and shoes and toiletries assuming I pack light and still have room to bring bottles home with me – in a secure way. Looking for other ideas on packing wine in a suitcase or shipping wine from overseas? Click over to Carpe Travel’s Wine Travel Guide. Note to the Reader: I was provided a wine suitcase to review AND there are affiliate links within this post. In other words, if you click through to one of the products and make a purchase I will get a few pennies. Any and all of those pennies go back into running Carpe Travel. Me, I’d love to have this suitcase. I’ve been afraid to carry wine on a trip…now I know there is a good solution…thanks. 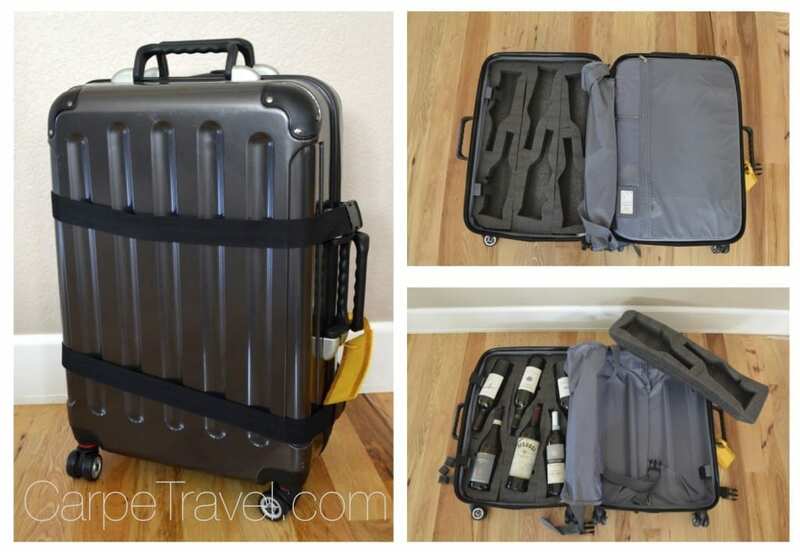 Great product review – I love the idea of this suitcase and it looks very classy as well. We’re planning a California Wine trip in 2015 and one of these would be fabulous to get our treasures back to Canada. We’ll look into it! Thanks. Hope you’ll come by our luxury travel website when you have some time. Would love to hear from you!